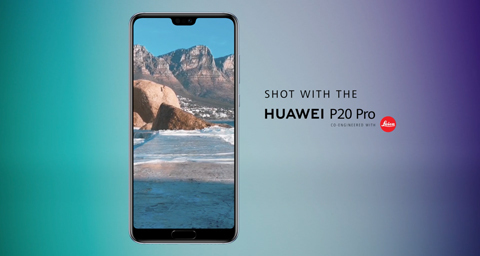 JOHANNESBURG – May 16, 2018 HUAWEI Consumer Business South Africa has released its latest television commercial shot 100 percent on the new HUAWEI P20 Pro smartphone highlighting the beauty of South Africa through its camera technology. HUAWEI challenged the SoCoMunity, a bunch of creatives to shoot the local television commercial entirely on the HUAWEI P20 Pro smartphone. Shawn Ogulu, Ofentse Mwase, Craig Howes and Natassja Zuidmeer shot and produced the television commercial around South Africa, showcasing the beauty of our country. The television commercial formed part of the HUAWEI's "See Mooore" campaign which launched in April this year as part of the HUAWEI P20 series launch. Marketing Director at HUAWEI Consumer Business Group South Africa, Akhram Mohamed said "It's an emotional television commercial and reflects South Africa's beauty. This was an exciting collaboration for us as we got these creatives to test out the capabilities of our latest flagship by pushing the limits on the phone and shooting this television commercial". HUAWEI's P-series smartphones are known for its best-in-class camera and cutting-edge technology which allowed the photographers to capture the best footage through the lens of the HUAWEI P20 Pro. Campaign manager at SoCoMunity and photographer, Shawn Ogulu was one of the creatives tasked with producing the commercial said that he did not believe the project would be possible at first but was amazed by the results. "From our research we noticed that a lot of other "shot-on-smartphone" ads were only achieved through assistance such as attaching DSLR lenses to a smartphone. We looked at going that route, but once we received the smartphones from HUAWEI, we were pleasantly surprised to see that we could actually shoot the commercial using nothing but the phone and some handheld stabilisers. We were amazed at the results," Ogulu said. Travel photographer and film maker, Craig Howes said he was immediately impressed with the triple leica lens cameras, but didn't think the feat of shooting an entire TV commercial on a smartphone would be possible. "I just didn't think the end result would look this good. Most people can't believe it's 100% shot on phone. I loved the challenge and it's something I've always wanted to do. The phone has incredible resolution and some really nice functions. In some instances shooting with a phone was easier and other instances it was harder. I'm very proud to say we put out a video that's 100% shot on the HUAWEI P20 Pro, but doesn't look like it was shot on a phone," Howes said. The television commercial will be showcased on various DSTV channels. Consumers can also watch the television commercial by subscribing to HUAWEI South Africa Mobile You Tube channel.